Not just plain and simple voodoo dolls! These are very special! 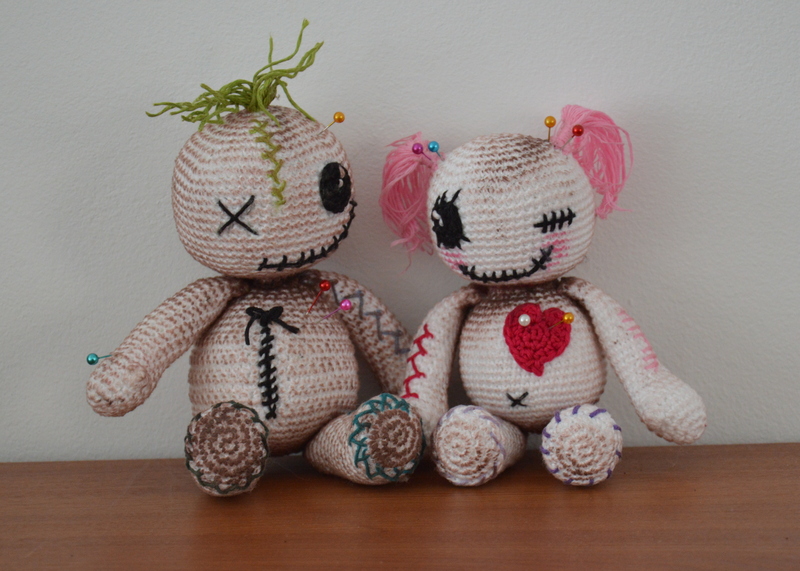 They are lovable, huggable, kissable, simple irresistible voodoo dolls that will melt your heart on first sight. And above all they are dolls with feelings, so please take it easy when using pins on them! These simple voodoo dolls are simple and easy to make and will make great addition to your doll collection or as fun companion for your little ones. Pop-corn – pop corn stitch used to make a thumb on dolls hands (I used pop corn stitch made out f three double crochet stitches; you can also use cluster stitch here-whichever you find easier to make this little thumb popping out, will be fine). Doll is made in continuous rounds. Body with the opening n front (if you decide to make one) has part with 10 rows (instead of continuous rounds), that will be indicated under open body part of the pattern given below. For any questions, please feel free to contact me. Fasten off. Stuff the head nice and firm. Fasten off and stuff the body. As you have finished R19, ch1 and single crochet the side of rows. When reaching bottom or single crochet left on R9 slip stitch that one and continue single crocheting other side of your rows. R20 ch1, do not turn but continue crocheting as you would in any other round. Sc47, ch1 and sl st to chain made when starting this round. From now on continue working in spiral as we sis with the bottom part of the body. Fasten off , hide end, On the opening we made at the belly part you can lace as lacing the shoe, or you can sew little zipper on. You can add one or two buttons to it. My idea was making little treasures keeping doll out of one of my voodoos and think children will like this idea too. Fasten off, hide end. Stuff the arm nicely, leaving top part of the arm empty or stuffed very light (so the arms can fall over the body nice way). For boy I added few strings of yarn I attached on the very first round of the head. For the girls used two strings I waved around several stitches and then tided them together in little pig tails. For your girl dolls you can ad braids instead or make tassels, or one bigger pony tail on top or back of the head. With white yarn embroider two tiny little dots to make doll’s eye(s) alive. On girl voodoo the heart I made on her chest was done using pattern you can find here. Pattern was created by Lucy from Attic24. It is very easy and beautiful tiny heart to make. At the end, let me tell you about staining the doll, or making it look dirty as I did with two of my voodoo dolls. I took some crayons (oil based) that I applied directly on doll. Then with my fingers I tried to smudge the crayon I applied as much as I could all around the toy. Boy was the first one I made and he ended up too dirty (also the brown I used was too dark and I am not 100% satisfied with the look, but still think both are better than very clean white). With girl was little bit more careful and she ended up better. I suggest you try it. Dirty little voodoo it looks great and it is fun to do! Wishing you all wonderful end of the week and blessed weekend to come. Previous post: It’s Beer Time!!!! Happy OctoberFest! bonjour j’adore je voulais proposé en projet commun sur mon groupe FB est ce que je peux ?? Yes. please feel free to share your projects on FB. Wonderful work you do and I am glad you’ve chosen some of my patterns to try. These are adorable. I’ve never made a amigurumi project, but I am so excited to try this one. Thank you for sharing. Thanks so much for the pattern, these are just “too” cute and I have a couple girls that will love them! Hello! They are lovely !!! I love them! I wondered how many inches they measure? And, what you have taken exactly as pencil for “dirty”? Makeup pencil? Does it stain? Is it in the wash? I have a friend who would like to have for a gift for his nephew but it’s a baby, so I do not know what to do to give it a worn look. Any idea? Thank you in advance! And nice work again !! voodoo dolls are about 30 cm from heat to toe. I dirtied mine with oil based pastels. Simple school crayons but on oil base instead of water. That makes them easy to apply and oil that is inside them makes stains that you can smudge. If making it for baby, I would rather go for something more natural. You can go for cocoa or coffee diluted in hot water (both make stronger), use sponge or cotton to apply on doll. This is much better solution for babies. I can try making one and showing you how it works.